Contraction/Desiccation cracks in dry earth (Sonoran desert, Mexico). A drought or drouth is a natural disaster of below-average precipitation in a given region, resulting in prolonged shortages in the water supply, whether atmospheric, surface water or ground water. A drought can last for months or years, or may be declared after as few as 15 days. It can have a substantial impact on the ecosystem and agriculture of the affected region and harm to the local economy. Annual dry seasons in the tropics significantly increase the chances of a drought developing and subsequent bush fires. Periods of heat can significantly worsen drought conditions by hastening evaporation of water vapour. Many plant species, such as those in the family Cactaceae (or cacti), have drought tolerance adaptations like reduced leaf area and waxy cuticles to enhance their ability to tolerate drought. Some others survive dry periods as buried seeds. Semi-permanent drought produces arid biomes such as deserts and grasslands. Prolonged droughts have caused mass migrations and humanitarian crisis. Most arid ecosystems have inherently low productivity. The most prolonged drought ever in the world in recorded history occurred in the Atacama Desert in Chile (400 Years). Mechanisms of producing precipitation include convective, stratiform, and orographic rainfall. Convective processes involve strong vertical motions that can cause the overturning of the atmosphere in that location within an hour and cause heavy precipitation, while stratiform processes involve weaker upward motions and less intense precipitation over a longer duration. Precipitation can be divided into three categories, based on whether it falls as liquid water, liquid water that freezes on contact with the surface, or ice. Droughts occur mainly in areas where normal levels of rainfall are, in themselves, low. If these factors do not support precipitation volumes sufficiently to reach the surface over a sufficient time, the result is a drought. Drought can be triggered by a high level of reflected sunlight and above average prevalence of high pressure systems, winds carrying continental, rather than oceanic air masses, and ridges of high pressure areas aloft can prevent or restrict the developing of thunderstorm activity or rainfall over one certain region. Once a region is within drought, feedback mechanisms such as local arid air, hot conditions which can promote warm core ridging, and minimal evapotranspiration can worsen drought conditions. Within the tropics, distinct, wet and dry seasons emerge due to the movement of the Intertropical Convergence Zone or Monsoon trough. The dry season greatly increases drought occurrence, and is characterized by its low humidity, with watering holes and rivers drying up. Because of the lack of these watering holes, many grazing animals are forced to migrate due to the lack of water in search of more fertile lands. Examples of such animals are zebras, elephants, and wildebeest. Because of the lack of water in the plants, bushfires are common. Since water vapor becomes more energetic with increasing temperature, more water vapor is required to increase relative humidity values to 100% at higher temperatures (or to get the temperature to fall to the dew point). Periods of warmth quicken the pace of fruit and vegetable production, increase evaporation and transpiration from plants, and worsen drought conditions. Drier and hotter weather occurs in parts of the Amazon River Basin, Colombia, and Central America during El Niño events. Winters during the El Niño are warmer and drier than average conditions in the Northwest, northern Midwest, and northern Mideast United States, so those regions experience reduced snowfalls. Conditions are also drier than normal from December to February in south-central Africa, mainly in Zambia, Zimbabwe, Mozambique, and Botswana. Direct effects of El Niño resulting in drier conditions occur in parts of Southeast Asia and Northern Australia, increasing bush fires, worsening haze, and decreasing air quality dramatically. Drier-than-normal conditions are also in general observed in Queensland, inland Victoria, inland New South Wales, and eastern Tasmania from June to August. As warm water spreads from the west Pacific and the Indian Ocean to the east Pacific, it causes extensive drought in the western Pacific. Singapore experienced the driest February in 2014 since records began in 1869, with only 6.3 mm of rain falling in the month and temperatures hitting as high as 35 °C on 26 February. The years 1968 and 2005 had the next driest Februaries, when 8.4 mm of rain fell. Human activity can directly trigger exacerbating factors such as over farming, excessive irrigation, deforestation, and erosion adversely impact the ability of the land to capture and hold water. In arid climates, the main source of erosion is wind. Erosion can be the result of material movement by the wind. The wind can cause small particles to be lifted and therefore moved to another region (deflation). Suspended particles within the wind may impact on solid objects causing erosion by abrasion (ecological succession). Wind erosion generally occurs in areas with little or no vegetation, often in areas where there is insufficient rainfall to support vegetation. Fields outside Benambra, Victoria, Australia suffering from drought conditions. Loess is a homogeneous, typically nonstratified, porous, friable, slightly coherent, often calcareous, fine-grained, silty, pale yellow or buff, windblown (Aeolian) sediment. It generally occurs as a widespread blanket deposit that covers areas of hundreds of square kilometers and tens of meters thick. Loess often stands in either steep or vertical faces. Loess tends to develop into highly rich soils. Under appropriate climatic conditions, areas with loess are among the most agriculturally productive in the world. Loess deposits are geologically unstable by nature, and will erode very readily. Therefore, windbreaks (such as big trees and bushes) are often planted by farmers to reduce the wind erosion of loess. Wind erosion is much more severe in arid areas and during times of drought. 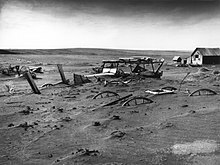 For example, in the Great Plains, it is estimated that soil loss due to wind erosion can be as much as 6100 times greater in drought years than in wet years. Activities resulting in global climate change are expected to trigger droughts with a substantial impact on agriculture throughout the world, and especially in developing nations. Overall, global warming will result in increased world rainfall. Along with drought in some areas, flooding and erosion will increase in others. Paradoxically, some proposed solutions to global warming that focus on more active techniques, solar radiation management through the use of a space sunshade for one, may also carry with them increased chances of drought. Meteorological drought occurs when there is a prolonged time with less than average precipitation. Meteorological drought usually precedes the other kinds of drought. Agricultural droughts affect crop production or the ecology of the range. This condition can also arise independently from any change in precipitation levels when soil conditions and erosion triggered by poorly planned agricultural endeavors cause a shortfall in water available to the crops. However, in a traditional drought, it is caused by an extended period of below average precipitation. Hydrological drought is brought about when the water reserves available in sources such as aquifers, lakes and reservoirs fall below the statistical average. Hydrological drought tends to show up more slowly because it involves stored water that is used but not replenished. Like an agricultural drought, this can be triggered by more than just a loss of rainfall. For instance, around 2007 Kazakhstan was awarded a large amount of money by the World Bank to restore water that had been diverted to other nations from the Aral Sea under Soviet rule. Similar circumstances also place their largest lake, Balkhash, at risk of completely drying out. A Mongolian gazelle dead due to drought. One can divide the effects of droughts and water shortages into three groups: environmental, economic and social. In the case of environmental effects: lower surface and subterranean water-levels, lower flow-levels (with a decrease below the minimum leading to direct danger for amphibian life), increased pollution of surface water, the drying out of wetlands, more and larger fires, higher deflation intensity, loss of biodiversity, worse health of trees and the appearance of pests and dendroid diseases. Economic losses include lower agricultural, forests, game and fishing output, higher food-production costs, lower energy-production levels in hydro plants, losses caused by depleted water tourism and transport revenue, problems with water supply for the energy sector and for technological processes in metallurgy, mining, the chemical, paper, wood, foodstuff industries etc., disruption of water supplies for municipal economies. Social costs include the negative effect on the health of people directly exposed to this phenomenon (excessive heat waves), possible limitation of water supplies, increased pollution levels, high food-costs, stress caused by failed harvests, etc. This explains why droughts and fresh water shortages operate as a factor which increases the gap between developed and developing countries. Effects vary according to vulnerability. For example, subsistence farmers are more likely to migrate during drought because they do not have alternative food-sources. Areas with populations that depend on water sources as a major food-source are more vulnerable to famine. Hunger – drought provides too little water to support food crops. Wildfires, such as Australian bushfires, become more common during times of drought and may cause human deaths. Exposure and oxidation of acid sulfate soils due to falling surface- and ground-water levels. Cyanotoxin accumulation within food chains and water supply (some of which are among the most potent toxins known to science) can cause cancer with low exposure over the long term. High levels of microcystin appeared in San Francisco Bay Area salt-water shellfish and fresh-water supplies throughout the state of California in 2016. Drought is a normal, recurring feature of the climate in most parts of the world. It is among the earliest documented climatic events, present in the Epic of Gilgamesh and tied to the Biblical story of Joseph's arrival in and the later Exodus from Ancient Egypt. Hunter-gatherer migrations in 9,500 BC Chile have been linked to the phenomenon, as has the exodus of early humans out of Africa and into the rest of the world around 135,000 years ago. 1900 India killing between 250,000 and 3.25 million. 1928–30 Northwest China resulting in over 3 million deaths by famine. 1936 and 1941 Sichuan Province China resulting in 5 million and 2.5 million deaths respectively. The 1997–2009 Millennium Drought in Australia led to a water supply crisis across much of the country. As a result, many desalination plants were built for the first time (see list). In 2006, Sichuan Province China experienced its worst drought in modern times with nearly 8 million people and over 7 million cattle facing water shortages. 12-year drought that was devastating southwest Western Australia, southeast South Australia, Victoria and northern Tasmania was "very severe and without historical precedent". Affected areas in the western Sahel belt during the 2012 drought. The Darfur conflict in Sudan, also affecting Chad, was fueled by decades of drought; combination of drought, desertification and overpopulation are among the causes of the Darfur conflict, because the Arab Baggara nomads searching for water have to take their livestock further south, to land mainly occupied by non-Arab farming people. Approximately 2.4 billion people live in the drainage basin of the Himalayan rivers. India, China, Pakistan, Bangladesh, Nepal and Myanmar could experience floods followed by droughts in coming decades. Drought in India affecting the Ganges is of particular concern, as it provides drinking water and agricultural irrigation for more than 500 million people. The west coast of North America, which gets much of its water from glaciers in mountain ranges such as the Rocky Mountains and Sierra Nevada, also would be affected. Drought affected area in Karnataka, India in 2012. In 2005, parts of the Amazon basin experienced the worst drought in 100 years. A 23 July 2006 article reported Woods Hole Research Center results showing that the forest in its present form could survive only three years of drought. Scientists at the Brazilian National Institute of Amazonian Research argue in the article that this drought response, coupled with the effects of deforestation on regional climate, are pushing the rainforest towards a "tipping point" where it would irreversibly start to die. It concludes that the rainforest is on the brink of being turned into savanna or desert, with catastrophic consequences for the world's climate. According to the WWF, the combination of climate change and deforestation increases the drying effect of dead trees that fuels forest fires. Lake Chad in a 2001 satellite image. The lake has shrunk by 95% since the 1960s. By far the largest part of Australia is desert or semi-arid lands commonly known as the outback. A 2005 study by Australian and American researchers investigated the desertification of the interior, and suggested that one explanation was related to human settlers who arrived about 50,000 years ago. Regular burning by these settlers could have prevented monsoons from reaching interior Australia. In June 2008 it became known that an expert panel had warned of long term, maybe irreversible, severe ecological damage for the whole Murray-Darling basin if it did not receive sufficient water by October 2008. Australia could experience more severe droughts and they could become more frequent in the future, a government-commissioned report said on July 6, 2008. Australian environmentalist Tim Flannery, predicted that unless it made drastic changes, Perth in Western Australia could become the world’s first ghost metropolis, an abandoned city with no more water to sustain its population. The long Australian Millennial drought broke in 2010. 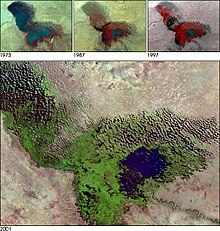 Recurring droughts leading to desertification in East Africa have created grave ecological catastrophes, prompting food shortages in 1984–85, 2006 and 2011. During the 2011 drought, an estimated 50,000 to 150,000 people were reported to have died, though these figures and the extent of the crisis are disputed. In February 2012, the UN announced that the crisis was over due to a scaling up of relief efforts and a bumper harvest. Aid agencies subsequently shifted their emphasis to recovery efforts, including digging irrigation canals and distributing plant seeds. In 2012, a severe drought struck the western Sahel. The Methodist Relief & Development Fund (MRDF) reported that more than 10 million people in the region were at risk of famine due to a month-long heat wave that was hovering over Niger, Mali, Mauritania and Burkina Faso. A fund of about £20,000 was distributed to the drought-hit countries. Succulent plants are well-adapted to survive long periods of drought. 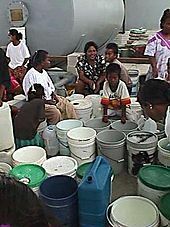 Water distribution on Marshall Islands during El Niño. Agriculturally, people can effectively mitigate much of the impact of drought through irrigation and crop rotation. Failure to develop adequate drought mitigation strategies carries a grave human cost in the modern era, exacerbated by ever-increasing population densities. President Roosevelt on April 27, 1935, signed documents creating the Soil Conservation Service (SCS)—now the Natural Resources Conservation Service (NRCS). Models of the law were sent to each state where they were enacted. These were the first enduring practical programs to curtail future susceptibility to drought, creating agencies that first began to stress soil conservation measures to protect farm lands today. It was not until the 1950s that there was an importance placed on water conservation was put into the existing laws (NRCS 2014). Aerosols over the Amazon each September for four burning seasons (2005 through 2008) during the Amazon basin drought. The aerosol scale (yellow to dark reddish-brown) indicates the relative amount of particles that absorb sunlight. Dams – many dams and their associated reservoirs supply additional water in times of drought. Cloud seeding – a form of intentional weather modification to induce rainfall. This remains a hotly debated topic, as the United States National Research Council released a report in 2004 stating that to date, there is still no convincing scientific proof of the efficacy of intentional weather modification. Desalination – use of sea water for irrigation or consumption. Drought monitoring – Continuous observation of rainfall levels and comparisons with current usage levels can help prevent man-made drought. For instance, analysis of water usage in Yemen has revealed that their water table (underground water level) is put at grave risk by over-use to fertilize their Khat crop. Careful monitoring of moisture levels can also help predict increased risk for wildfires, using such metrics as the Keetch-Byram Drought Index or Palmer Drought Index. Land use – Carefully planned crop rotation can help to minimize erosion and allow farmers to plant less water-dependent crops in drier years. Outdoor water-use restriction – Regulating the use of sprinklers, hoses or buckets on outdoor plants, filling pools, and other water-intensive home maintenance tasks. 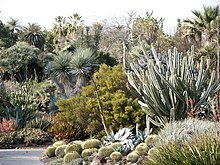 Xeriscaping yards can significantly reduce unnecessary water use by residents of towns and cities. Rainwater harvesting – Collection and storage of rainwater from roofs or other suitable catchments. Recycled water – Former wastewater (sewage) that has been treated and purified for reuse. Transvasement – Building canals or redirecting rivers as massive attempts at irrigation in drought-prone areas. ^ It's a scorcher - and Ireland is officially 'in drought' Irish Independent, 2013-07-18. ^ Australian Drought and Climate Change, retrieved on June 7th 2007. ^ "Driest Place: Atacama Desert, Chile". Extreme Science. Retrieved September 25, 2016. .
^ Emmanouil N. Anagnostou (2004). "A convective/stratiform precipitation classification algorithm for volume scanning weather radar observations". Meteorological Applications. 11 (4): 291–300. Bibcode:2004MeApp..11..291A. doi:10.1017/S1350482704001409. ^ A.J. Dore; M. Mousavi-Baygi; R.I. Smith; J. Hall; D. Fowler; T.W. Choularton (June 2006). "A model of annual orographic precipitation and acid deposition and its application to Snowdonia". Atmospheric Environment. 40 (18): 3316–3326. Bibcode:2006AtmEn..40.3316D. doi:10.1016/j.atmosenv.2006.01.043. ^ Robert Penrose Pearce (2002). Meteorology at the Millennium. Academic Press. p. 66. ISBN 978-0-12-548035-2. Retrieved 2009-01-02. ^ Houze, Robert A., Jr. (1993). Cloud dynamics. San Diego: Academic Press. ISBN 9780080502106. OCLC 427392836. ^ Roland Paepe; Rhodes Whitmore Fairbridge; Saskia Jelgersma (1990). Greenhouse Effect, Sea Level and Drought. Springer Science & Business Media. p. 22. ISBN 978-0792310174. ^ Joseph S. D'Aleo; Pamela G. Grube (2002). 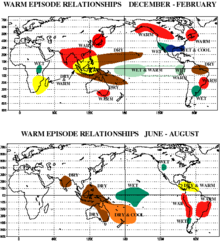 The Oryx Resource Guide to El Niño and La Niña. Greenwood Publishing Group. pp. 48–49. ISBN 978-1573563789. ^ Bin Wang (2006-01-13). The Asian Monsoon. Springer Science & Business Media. p. 206. ISBN 978-3540406105. ^ Vijendra K. Boken; Arthur P. Cracknell; Ronald L. Heathcote (2005-03-24). Monitoring and Predicting Agricultural Drought : A Global Study: A Global Study. Oxford University Press. p. 349. ISBN 978-0198036784. ^ TONY RENNELL (June 29, 2007). "It's dry season and elephants are desperately seeking water - but poachers lie in wait". London: Daily Mail. ^ "Wet & Dry Seasons". Archived from the original on 2012-03-21. Retrieved 2018-12-23. ^ Alistair B. Fraser (1994-11-27). "Bad Meteorology: The reason clouds form when air cools is because cold air cannot hold as much water vapor as warm air". Retrieved 2015-02-17. ^ Cooperative Extension Service (January 2014). Home Vegetable Gardening in Kentucky (PDF). University of Kentucky. p. 19. Retrieved 2015-02-18. ^ North Carolina State University (2013-08-09). "Evapotranspiration". Archived from the original on 2015-02-19. Retrieved 2015-02-18. ^ National Oceanic and Atmospheric Administration (2002-05-16). "Warm Temperatures and Severe Drought Continued in April Throughout Parts of the United States; Global Temperature For April Second Warmest on Record". Retrieved 2015-02-18. ^ "A biblical tragedy as Sea of Galilee faces drought". BelfastTelegraph.co.uk. ^ "Kenya: Deforestation exacerbates droughts, floods". forests.org. Archived from the original on 2011-09-27. Retrieved 2008-05-24. ^ a b Vern Hofman; Dave Franzen (1997). "Emergency Tillage to Control Wind Erosion". North Dakota State University Extension Service. Retrieved 2009-03-21. ^ United States Geological Survey (2004). "Dunes – Getting Started". Retrieved 2009-03-21. ^ F. von Richthofen (1882). "On the mode of origin of the loess". Geological Magazine (Decade II). 9 (7): 293–305. Bibcode:1882GeoM....9..293R. doi:10.1017/S001675680017164X. ^ K.E.K. Neuendorf; J.P. Mehl, Jr.; J.A. Jackson (2005). Glossary of Geology. Springer-Verlag, New York. p. 779. ISBN 978-3-540-27951-8. ^ Arthur Getis; Judith Getis and Jerome D. Fellmann (2000). Introduction to Geography, Seventh Edition. McGraw-Hill. p. 99. ISBN 978-0-697-38506-2. ^ Wiggs, Giles F.S. (2011). "Geomorphological hazards in drylands". In Thomas, David S.G. (ed.). Arid Zone Geomorphology: Process, Form and Change in Drylands. John Wiley & Sons. p. 588. ISBN 978-0-470-71076-0. The distribution of all the water on the earth’s surface is not even. Some places have lots of fresh water (rivers, lakes, lagoons, ponds etc.) and are continuously replenished by rainfall, runoffs and water from underground. Others places too are known to have very little water. Therefore, if a region that has lots of rainfall, goes for a couple of weeks without rains, and people, animals and plants begin to experience a bit of dryness, it can be called drought. At the same time, that condition may be very normal for places with no water, and can go for months without any rains with little problems. ^ Smith, Adam B.; Katz, Richard W. (2013). "Smith A.B. and R. Katz, 2013: U.S. Billion-dollar weather and climate disasters: Data sources, trends, accuracy and biases. Natural Hazards, 67, 387–410, doi:10.1007/s11069-013-0566-5" (PDF). Natural Hazards. 67 (2): 387–410. doi:10.1007/s11069-013-0566-5. Retrieved 5 November 2017. ^ "Finfacts: Irish business, finance news on economics". finfacts.com. ^ "Nigerian Scholar Links Drought, Climate Change to Conflict in Africa - US Department of State". state.gov. Archived from the original on 28 October 2005. ^ "Is Water the New Oil?". Common Dreams. ^ Swain, S; et al. (2017). "Application of SPI, EDI and PNPI using MSWEP precipitation data over Marathwada, India". IEEE International Geoscience and Remote Sensing Symposium (IGARSS. 2017: 5505–5507. doi:10.1109/IGARSS.2017.8128250. ISBN 978-1-5090-4951-6. Retrieved 15 June 2018. ^ "What is a Drought?" (PDF). National Oceanic and Atmospheric Administration. August 2006. Retrieved 2007-04-10. ^ "BBC NEWS - Asia-Pacific - Dam project aims to save Aral Sea". bbc.co.uk. ^ "BBC NEWS - Asia-Pacific - Kazakh lake 'could dry up'". bbc.co.uk. ^ Prokurat, Sergiusz (2015). "Drought and water shortages in Asia as a threat and economic problem" (PDF). Journal of Modern Science. 26 (3). Retrieved 4 August 2016. ^ Mosley LM (2014). Drought impacts on the water quality of freshwater systems; review and integration. Earth Science Reviews. DOI: 10.1016/j.earscirev.2014.11.010. ^ 10. Mosley LM, Zammit B, Leyden E, Heneker TM, Hipsey MR, Skinner D, and Aldridge KT (2012). The Impact of Extreme Low Flows on the Water Quality of the Lower Murray River and Lakes (South Australia). Water Resources Management 26: 3923–3946. ^ "Parched village sues to shut tap at Coke / Drought-hit Indians say plant draining groundwater". SFGate. ^ "Sweden closes nuclear plants over safety fears". Greenpeace International. Archived from the original on 2009-01-10. Retrieved 2016-02-06. ^ "BBC NEWS - Asia-Pacific - Australians face snake invasion". bbc.co.uk. ^ a b "TFS Article". tamu.edu. Archived from the original on 11 July 2003. ^ Mosley LM, Zammit B, Jolley A, and Barnett L (2014). Acidification of lake water due to drought. Journal of Hydrology. 511: 484–493. ^ Mosley LM, Palmer D, Leyden E, Fitzpatrick R, and Shand P (2014). Acidification of floodplains due to river level decline during drought. Journal of Contaminant Hydrology 161: 10–23. ^ Mosley LM, Palmer D, Leyden E, Fitzpatrick R, and Shand P (2014). Changes in acidity and metal geochemistry in soils, groundwater, drain and river water in the Lower Murray River after a severe drought. Science of the Total Environment 485–486: 281–291. ^ "Toxins from freshwater algae found in San Francisco Bay shellfish". Retrieved 5 November 2017. ^ "BBC - Weather Centre - Features - History and Religion - Weather in the Bible - Drought and Famine". Retrieved 5 November 2017. ^ "Ancient Chile Migration Mystery Tied to Drought". nationalgeographic.com. ^ Andreas Frey (2018-08-04). "Elf Monate ohne Regen: Die Angst vor der Megadürre des Jahres 1540 geht um" (in German). Neue Zürcher Zeitung. Retrieved 2018-08-06. ^ "Climate change tripled likelihood of drought that pushed Cape Town water crisis to 'Day Zero' brink, say scientists". Red Cross Red Crescent Climate Centre. Reliefweb. 16 July 2018. Retrieved 22 November 2018. ^ "People & the Planet > climate change > newsfile > big melt threatens millions, says un". peopleandplanet.net. Archived from the original on 19 August 2007. ^ "Ganges, Indus may not survive: climatologists". rediff.com. ^ "People's Daily Online - Glaciers melting at alarming speed". peopledaily.com.cn. ^ "BBC NEWS - Science/Nature - Himalaya glaciers melt unnoticed". bbc.co.uk. ^ "Glaciers Are Melting Faster Than Expected, UN Reports". ScienceDaily. ^ staff. "Amazon Drought Worst in 100 Years". www.ens-newswire.com. Retrieved 5 November 2017. ^ Amazon rainforest 'could become a desert' , The Independent, July 23, 2006. Retrieved September 28, 2006. ^ Dying Forest: One year to save the Amazon, The Independent, July 23, 2006. Retrieved September 28, 2006. ^ Climate change a threat to Amazon rainforest, warns WWF, World Wide Fund for Nature, March 9, 2996. Retrieved September 28, 2006. ^ "Plan B Updates - 47: Disappearing Lakes, Shrinking Seas - EPI". earth-policy.org. ^ "Shrinking African Lake Offers Lesson on Finite Resources". nationalgeographic.com. ^ "Fatal Failure: Did Aid Agencies Let Up To 100,000 Somalis Die in 2011?". Time. January 18, 2012. ^ Warah, Rasna (2 October 2011). "Manufacturing a famine: How Somalia crisis became a fund-raising opportunity". The East African. Retrieved 16 March 2013. ^ a b Gettleman, Jeffrey (3 February 2012). "U.N. Says Somalia Famine Has Ended, but Crisis Isn't Over". Retrieved 5 November 2017 – via www.nytimes.com. ^ "Methodists make appeal for famine threatened West Africa - Ekklesia". ekklesia.co.uk. ^ "State Conservation District Laws Development and Variations – NRCS". usda.gov. ^ Matt Weiser; Jeremy B. White (2014-06-01). "Should California build dams, reservoirs to help with future droughts?". Fresno Bee. Archived from the original on 2015-03-20. Retrieved 2015-02-18. 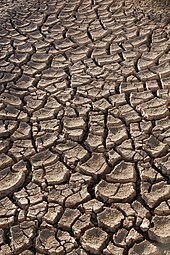 ^ "Cloud seeding helps alleviate drought". chinadaily.com.cn. ^ NRC. "Critical Issues in Weather Modification Research". ^ City of Santa Barbara (2014-12-22). "Desalinization". Retrieved 2015-02-18. Prokurat S., "Drought and water shortages in Asia as a threat and economic problem", in: "Journal of Modern Science", 26 March 2015, pp. 235–250. This page was last edited on 16 March 2019, at 10:55 (UTC).